Nope not a child’s literary or tv character (although I did discover there is a catkin fairy), rather those dancing little yellow tails you see on trees around this time of year. I like them. I like the way they stand out against the branches and I like the way they dance in the wind. I also like the colour, a soft creamy yellow. They represent the first signs of spring to me. Turns out these particular catkins, which are in abundance where I live, are the male flowers of the Hazel tree. A tree which was held with great regard by the Celts. Apparently the hazel tree represents wisdom, magic and creativity due to the interesting branch formations. The tree would be used for inspiration for art, poetry as well as for visualisations, as by contemplating the swirls of the branches would lead the watcher into another world. OOOOOO I thought, this is intriguing and exciting! So in a flash I thought could these particular trees have been the inspiration behind the Celtic knot work? Quite possibly as the Celtic designs are all based on the complexity and cycles of nature. I am not an expert by any means, but I do rather like the idea of looking at a Hazel tree as my ancestors would have done and seeing the shapes of the knotwork designs within. Also, I do love how one thing (noticing the Catkins) has led me down this path to other discoveries. It’s really what being a Creative Adventurer is all about. 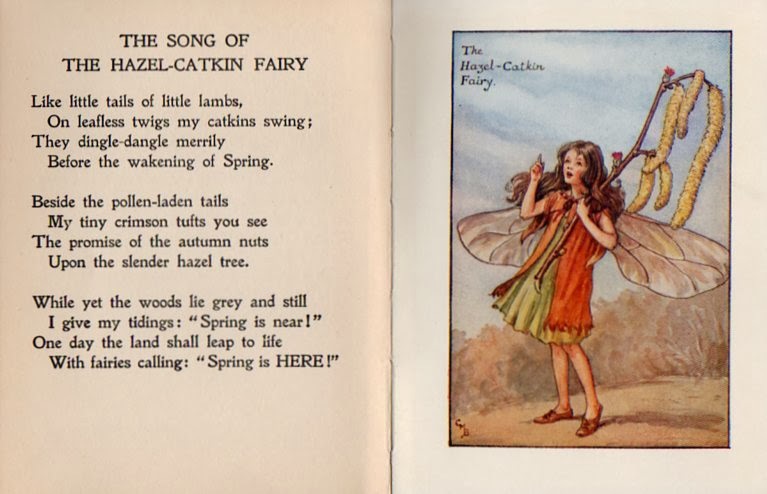 The Hazel Catkin Fairy even has a song...*lovely* from Cicely Mary Barker's Flower Fairies of the Spring. Or perhaps there is already a tree you've been noticing recently? What could it tell you? When is a good day to wear a Tiara? Hanging out at the Not Knowing Cafe. What does The Land of Self Belief look like?